A construction crew accidentally ruptured a natural gas pipe in Mission Hills Friday, prompting evacuations of several nearby homes and closures of surrounding streets pending repairs. A backhoe broke the half-inch-diameter line in the 1000 block of Fort Stockton Drive shortly before 10:30 a.m., according to San Diego Gas & Electric. Nearby Saint Vincent de Paul School kept students and staff indoors for a time as a precaution, and authorities cleared people out of three houses while SDG&E crews worked to get the problem under control. In addition, police shut down stretches of Fort Stockton Drive and Hawk, West Lewis and West Washington streets. A construction crew accidentally ruptured a natural gas pipe in Mission Hills Friday, prompting evacuations of several nearby homes and closures of surrounding streets pending repairs. Photo via OnScene.TV. Utility personnel had the leak halted by 11:45 a.m., SDG&E spokesman Joe Britton said. 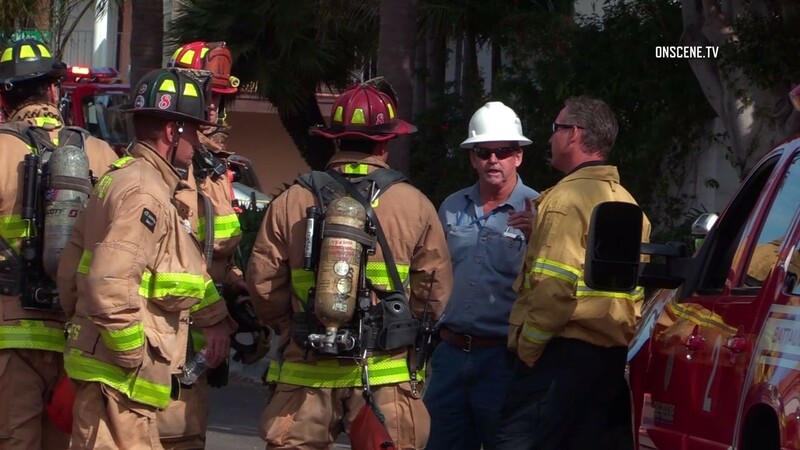 Repairs to the damaged gas line were ongoing in the early afternoon, Britton said.